More than six months after Apple introduced ARKit, apps based solely on the platform have surpassed 13 million downloads from the App Store. 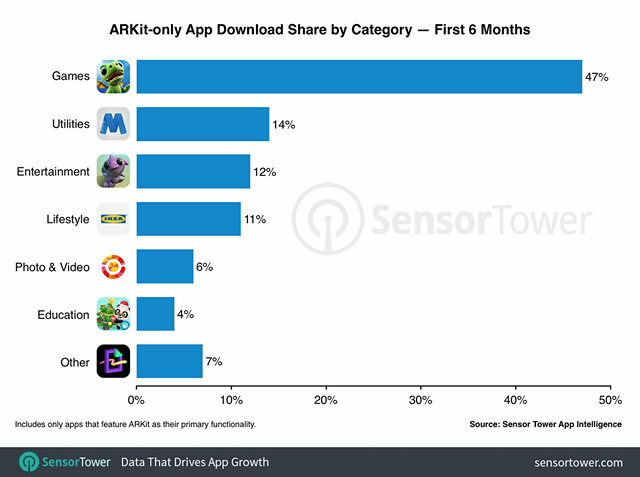 That’s according to Sensor Tower, whose latest report also suggests that the most popular ARKit apps fall under four major categories – Games, Utilities, Entertainment and Lifestyle. Games continue to be the leading category in the segment, with their share of ARKit-only downloads rising from 35 percent last October to 47 percent now. Back in October, a month after the launch of iOS 11, the download of ARKit-only apps stood at around the 3 million mark. While the share of Lifestyle-oriented ARKit-only apps have also risen (from 5 percent to 11 percent), the share of Utilities decreased from 19 percent to 15 percent. As per Sensor Tower’s data, many of the top ARKit titles today were also at the top of the list six months ago. PlaySide Studios’ popular game AR Dragon is still the No. 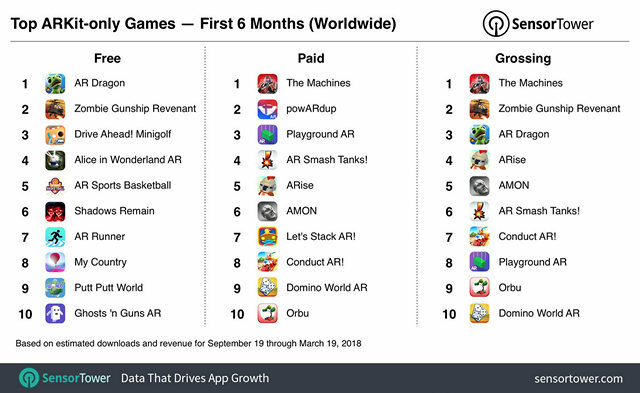 1 free AR app overall, while Directive Games’ The Machines remains the top premium AR game on the App Store. However, when it comes to apps other than games, the chart looks a tad different. 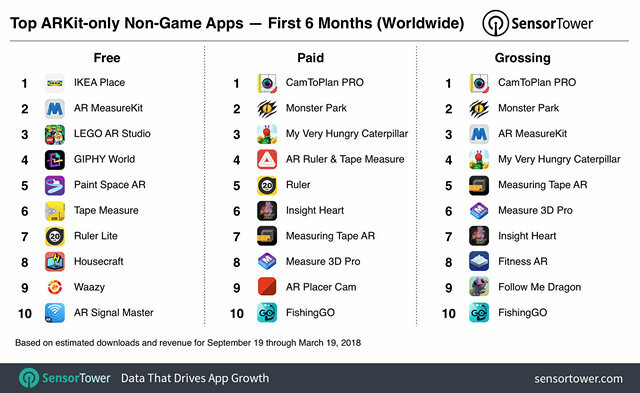 Tasmanic Editions’ CamToPlan Pro is now the top paid ARKit app, as opposed to Occipital, Inc.’s TapMeasure, which was at the top back in October. Ikea, meanwhile, is the most popular free ARKit (non-game) app on the App Store currently. 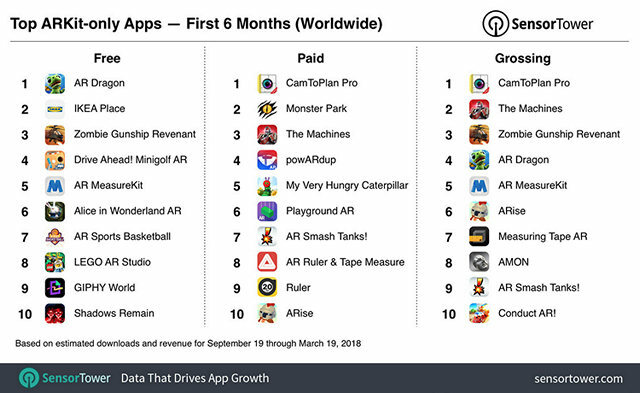 Overall, apps such as GIPHY World, My Very Hungry Caterpillar AR and others have also got into the top-10 list. It’s important to note here that while compiling this list, Sensor Tower only took into account apps that are “primarily focused on the AR experience”, and not apps that offer “limited ARKit content, such as AR photo modes, mini-games, and other ARKit-based features added onto otherwise traditional apps”.